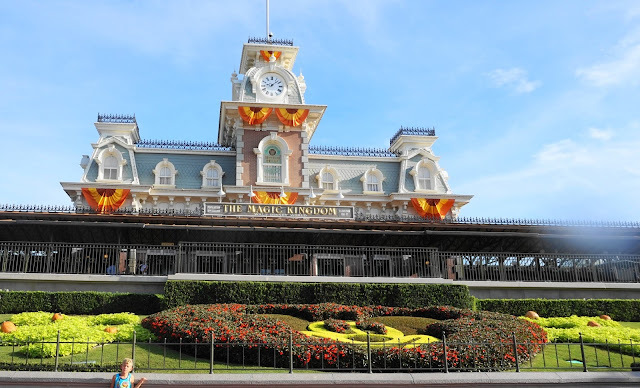 Planning a trip to Disney is one of the most exciting things you can do! I found it almost as good as going, well to some extent I was like a little kid reading up on all the exciting things I was about to experience for the first time. I was never lucky enough to visit as a child and had our first trip their fall of 2016 with our two children then 8 and 3. I personally know a few people interested in going the next year or two and I'm sure that with all the talk of Disney, heck we will probably visit again soon too. I will be doing all sorts of write ups on it over the next few weeks to get the magic flowing. Planning is great but where to start isn't always and when you have the key information you want you're all set. When you are stuck entering key words and having to sort through all sorts before you hit something of interest, it can waste a lot of time and make the great experience well annoying. Easter is approaching now in only a matter of days the kids are super excited. They managed to dye a couple of eggs and decorate some fake plastic ones. Then I remembered at Christmas I always make tons of cookies and spend hours decorating. Usually the kids only are interested in decorating a few. This past year however my 4 yr old was decorating for hours. He loved it and even his brother more capable in his abilities was enjoying icing the cookies too. So I decided that instead of decorating more eggs that it would be fun (and tasty) to decorate some cookies. I used Alton Brown's sugar cookie recipe on Food Network since I love his recipes. Any sugar cookie or another favourite cut out cookie recipe will do. My 4 yr old Logan has been very interested in all sorts lately particularly animals. His imagination is running wild. At school they learnt about penguins and he kept on going on about the Colossal penguin that became extinct years ago. So then we jump to dinosaurs because he hears they are extinct and he's bringing home books every library day etc. He's also been longing to see a chameleon. This has been a thing for months now because of the PJ Mask character Gecko who camouflages like a chameleon. Camouflage has been a topic in the kindergarten class too. Needless to say, a great save on Groupon landed us a visit to Little Ray's Reptile Zoo in Hamilton. Check it out, still available for a limited time. $33 gets you a family pass of 4. That is a savings of $15! Do you eat lentils? Well you should! Lentils are a nutritional powerhouse! In just half a cup of dry lentils you get 26 grams of protein. 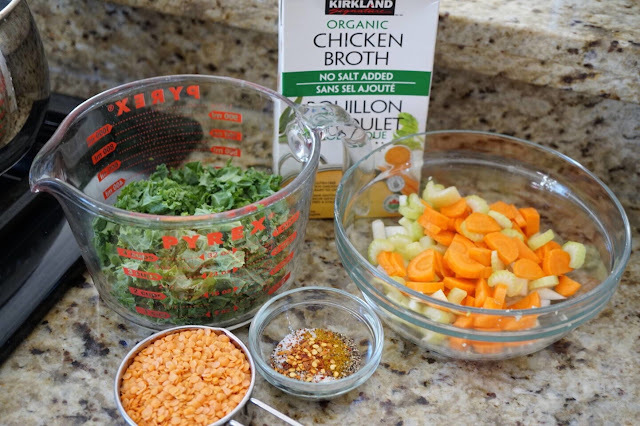 In the split red lentils used in this soup you have 4 grams of fiber (14% DV) per serving, 15% Iron and Folate and even 6% DV of potassium! I read on http://www.lentils.org/ that consuming pulses such as lentils reduces the development of type 2 diabetes. They really are a great addition to your diet and they add so much to a bowl of soup. They give the soup a whole new texture and flavour making the soup more satisfying all around. Easter has become my kids second favourite holiday only to be won over by Christmas. As a child that group up with a single mom from another country and she having lost her mother at the age of 3, she wasn't really hip on the Easter Bunny. Luckily I had the best sister ever (who is 12 years older then me) and would take on motherly duties often, making memories for me to cherish. I remember waking up to find a clue and having to solve the clue for another and another leading me to a little surprise. What a great big sis eh! Told ya. It was my only real Easter memory other then when we ate fish on Friday while my mom went along with that. Fast forward a few years (or more) and I've decided to create special memories for my kids each year and it makes me happy when they start getting excited about Easter! 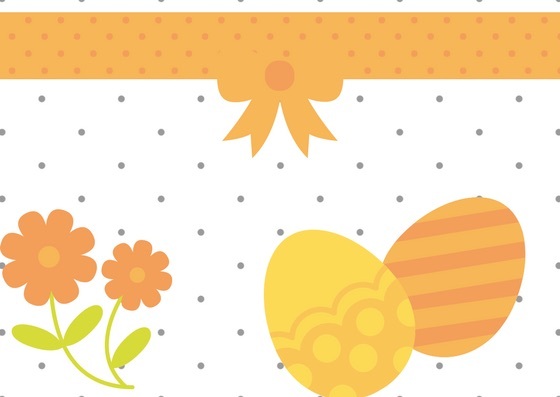 I have a few different ways I spread the Easter spirit with my little ones and maybe I can pass on some ideas for you and your family. Did you ever get a toy or a craft that you had your kids try and they enjoyed for a bit then you once you put away, well out of sight out of mind. Then we fast forward a couple of years and a second child finds them and well you get this! I got this container of PYSSLA from IKEA or perler beads as I've heard they are called in our neck of the woods. There is a 4 piece shape discs you use to place and shape with beads. This craft has kept my boys busy for hours. It isn't very expense at $8.99 for jar and $2.99 for discs. Michael's craft store also has an array of perler bead kits if IKEA isn't accessible to you or you can shop online at Amazon or the like. Pancakes aren't a very nutritious breakfast staple when you use good old white flour, even the whole wheat kind hasn't got much more fiber. I really like to give the kids (and myself) a good start in the morning and we all love pancakes and waffles which I like to make one or the other every weekend. To up the nutrition I like to use some whole grain that has lots more fiber then good old AP flour at 4g per serving. The quick steel cut oats I use I get from Costco and thankfully they sell there because I go through the stuff. I eat it at least 5 days a week in one way or another. Just good old warm oatmeal or yummy overnight oats and then I use ground in pancakes or waffles. You can use a regular blender to grind into flour but sometimes I find the bullet or mini blender easier clean up. We spent a day at Mountsberg this #Marchbreak. It is a great park to visit with kids. It has a lot to intrigue them even when there is no events. Like the play barn that my kids and most others always love. There is also the actual barn which has a few of the horses they have there among some sheep, chickens and rabbits. There is a few trails to go on, a birds of prey sanctuary where they have shows throughout the day, a lake and pond. There is also plenty of maples that they tap to use for their demonstrations and create maple syrup for pancake meals you can buy at the Pancake House. As you walk towards Maple Town you will see these blue buckets attached to tons (about 400) of sugar maples that sprawl through the forest. At the Sugar Shanty building the kids watch and learn how the sap is boiled down to different levels of maple syrup. Then you can head on in to the Candy Cabin and sample some fresh made candy (fudge like stuff) that is pretty tasty and my favourite stop. Another day of March Break fun with my Sister and my Great Niece. We decided to get some fresh air and venture out to Black Creek. During March Break (March 12-18th) they have a promotion that is all kids are free admission! That's a savings of $11 for each child. Adults are $15 and a Senior is $12. Also, if driving, $7 for parking. One of the events they have planned for March Break is Solve the Mystery! Junior Detectives watch a 5 minute video with their own Sherlock Holmes and Watson to solve the Case of the Missing Jewels. The kids then get their own booklet with 5 suspects, clues and places to write additional clues. They also have a code to decipher and at every building pretty much there is a clue or more to be found. They even suggest you can question the suspects when you arrive to their locations. When you are done there is another 5 min video on who the culprit is and you get to see if you solved the crime. My sister had taken a few days off this week with my great niece so we had a few ideas of what to do with the kids during #MarchBreak. The Ontario Science Centre was mentioned when we were humming about where to go and my deal sensing came into action.